Welcome to the new TCM Message Boards. Whether you are just joining us or coming over from the old TCM message board site, we hope you will enjoy the site! There are some new features hopefully will make posting easier to use! At the top of the page, to the left of your moniker are two icons. The farthest to the left is an open envelope- that is your PM box. Unfortunately, in the migration, everyone's old PMs were not able to be migrated over. The other icon is the Notification center where you can access Instant Message sent to you (and reply to them) and see your PM box. You can also set it up so that you are notified by email when someone responds to your message. Each icon will have a red box with a number on it when you receive a PM or Instant Message. 2) What happened to the old "Watch the Forum/Topic"
The old Watch this Forum/Thread has been replaced with boxes on the forum page that says "Follow this Forum" and in each thread is one that says "Follow this Topic". Clicking on those will allow you to follow an entire forum or individual threads. This is now much easier and less convoluted than it was in the old forums. There are three methods of posting images. A) The best option is to save the image to you computer and upload it to a picture hosting site like Photobucket. The advantages to that are you are able to organize your photos and reuse them in threads days, weeks and months later without having to search the web again for that one particular photo. Once you have the photo uploaded to Photobucket or another photo-hosting site, click on the Direct code and copy it (usually clicking on it will copy the code). Open a Reply Window here and click on the Image Icon (two to the right of the Link icon). Paste the Direct Code into the URL window. Finish your post and hit the Post button. When you see your reply in the thread it should also contain the photo. Open a Reply Window and Use the Full Editor. Upload the images from your computer as attachments, be sure to click on the Attach This File button when you are done uploading. Once they are uploaded, you should see them under the reply window. You can add them to your post, by clicking into the reply where you want one to go. Then click on add to this post and it should appear where you want. Finish your post and hit the Post button. The images will appear as Thumbnails in your post. Posters can click on the images to see them larger. Once the larger image has been used, use the X, to close out and the post should appear normally in the tread. In the Reply Window, you will see two levels of icons. On the bottom level, about half way over, there is a frame icon (two over from the link icon) with green in the middle. Use this icon to post images from other sites. Click on that and add the URL for the photo to the URL window. Finish your post and hit Post. When you see your post it should contain the image. Be aware that if you use this method, if the original website deletes the image or changes the URL it will affect how it is viewed in this forum. If the URL changes, the photo won't appear but will appear with a warning notice that the person posting it here did not have permission to do so or the image is no longer available. On the top level of icons, the third from the right is a frame with green highlights. When you hover over it with your mouse, it should say "Special BBCode". 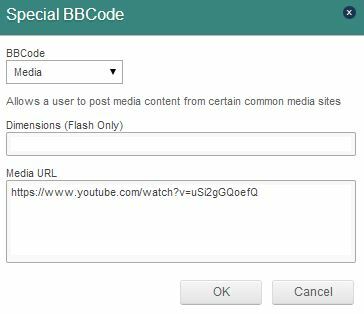 Click on the BBCode icon. It will open a small window and choose "Media". Paste the URL in the Media URL box and click OK. It should also then bracket the URL in the Reply Window. 5) Adding an avatar and changing your time zone. Go to your name at the top of the page and a pull-down menu should appear. Click on the "Change Photo" button to add or change your avatar. Keep in mind that your avatar can only 50kb or smaller. Right under that button is where you can change the time zone to match the one you are in. Just use the pull down menu to find your time zone. Be sure to hit the "Save Changes" button at the bottom before leaving the page. I apologize for the small images but if you click on them, they become larger. Right under menu for time zones is check box that says: "Automatically detect Daylight Savings Time". Be sure that box is checked. The time stamp may not correct until the next time you sign in. If you run across a post that looks like SPAM, abuses other posters or contains objectionable content, you can use the Report Button at the bottom of each post. Pressing on the Report Button will open up a new window where you can fill out a short report explaining why you think the post should be reported. Hit the Submit Button to send the report. To place another poster on "Ignore" means that you won't be able to see their posts. Posters often use this function to avoid confrontations with others. 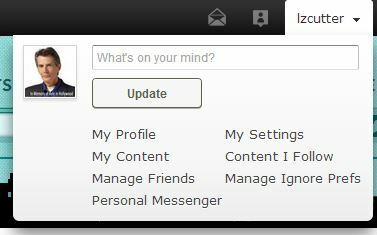 To place another poster on "Ignore" go into your Profile Setting. This is accessible from the pull down menu under your name in the upper right hand corner at the top of any page. Click on My Profile and then click on Edit My Profile on the right hand side of the profile page. That will take you to your General Account Settings. Profile Customization, Email Preferences, Display Name, Signature and the next one should be Ignore Preferences. At the top of the page you can choose to ignore all posters Signature lines by clicking the box at the top of the page. Please Note: This will mean that you are ignoring everyone's signature lines, not just individual posters by clicking this box. Further down the page, you can add the name(s) of posters whose posts you don't want to see or read. Click on the corresponding box to ignore their posts. Please Note: You can also choose to ignore not only their posts but their individual signature as well as any Private Messages from them. Be sure to hit the Save Changes Button before exiting the page for these changes to take affect. You must Sign In to the Boards in order to see and view (thumbnail) attachments. Signing in gives you "permission to view" these. Normal URL pics and videos are not affected. NOTE: As of this time these features may not work with Internet Explorer 11 (not sure of earlier versions). I have left a message concerning this in the Problems with the Message Boards Forum. I have been using Google Chrome which seems to have no such problems. All of the Quote features work well there. These can be used to include a Quote in your post or reply. Quote will let you quote all or part of someone's post (you can edit out or add to the quote as you would your own post). Click Quote, type your own message below the quote box as you would in any post, click Post to send. MultiQuote does the same thing except.. When you've read many posts in the same thread and would like to respond to more than one in your single reply, go to the first post you would like to respond to and..
Repeat until you have included all the previous posts you wish to include in your reply. Now, when you're ready to add your remarks, go back to that little box and click on the shaded Reply To #'s Quoted Post(s). This will open the message screen and it should be filled with quotes from all those you selected. All you have to do now is slip your remarks into the little spaces between each quoted poster. These spaces will expand to accommodate your text. When you are finished, click Post as you would normally. If you use this feature a lot, you may notice the MultiQuote may become your default quote button as it allows for quoting a single poster just as well. As of this morning, Quote/MultiQuote, along with Copy/Paste, appear to be functioning as designed when using IE11 (Internet Explorer 11) as your browser. When you click Quote or MultiQuote, you should now see the quoted text in your reply screen. Well, the mobil (iPhone) version of the message boards is excellent. Easy to navigate and looks good. Can't comment on how it looks in the Android platform. The iPad version is simply the standard web format. You need to manually expand the size of the page. Kind of trivial, yet annoying. All in all, I'm happy with the upgrade. Two quickies: What is my "Display Name" and why can I change it? And, what's this title thing which on myself says "Member" but others have it customized it say other things. How do I change that? Should you wish to not look at someones "signature" at the bottom of their post(s), you can sign-in, then go to that person's post, look at the bottom of it and you will see a Quote button.. move your mouse pointer just above and to the right of this and a little X will appear. Click this X and you will see options for dealing with other's "signatures" - if you wish. One reason you would want to change your Display Name: You may wish to "become" an actor; such as Errol Flynn, for example. Doesn't have to be an actor. You could pick Grand Canyon Peanuts. I believe you must have a certain number of posts under your belt before you can change your title. To do this, click your name at the top of the page and select My Settings. Scroll down to Profile Information - Member Title. Type what you wish in that bar and scroll to the bottom - click Save Changes. Thanks, Kid_Dabb. I guess I don't have the power to change my title yet, I don't see anything about it in my settings. Changing my Display Name sounds like it would overwrite my "Kay" handle, is that right? I wouldn't want to do that, seems like it would get confusing. ..Changing my Display Name sounds like it would overwrite my "Kay" handle, is that right? I wouldn't want to do that, seems like it would get confusing..
That is correct. Most of us don't change our Display Name unless there is a problem with it being messed up somehow in TCM's records and won't allow us to sign-in. Then there is another method for that change. Question: Why is Kay's title "Member" when other new accounts are titled "Newbie"? Mine changed from "Newbie" after my 10th post. Seemed rather sudden as it will probably take until my 100th post for it to change again. The system is changing for the better. reminder features and that's it. Okay, I understand now Kid_Dabb, I was hoping that I could sign up to get notices for my favorite films anytime they are shown on TMC, as an ongoing service. It would be great to have that option on every film in TCM's library, wouldn't it?